East Liverpool, Ohio police hope graphic photos of two who adults who overdosed in a car with a child in the back seat will raise awareness about the drug problem Ohio currently faces. The City of East Liverpool posted the photos on its Facebook page on Thursday. 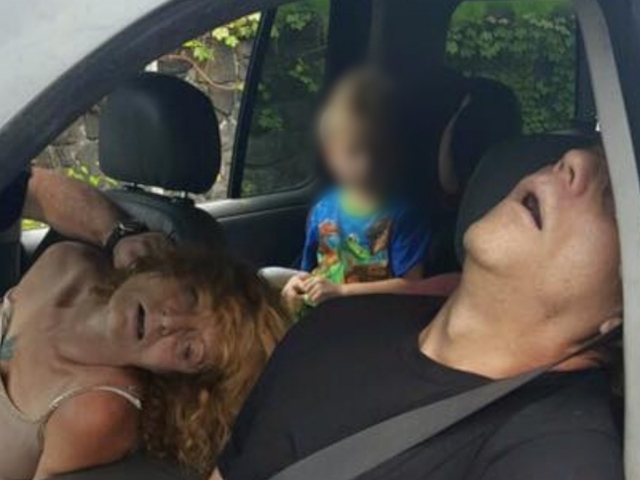 The photos show two unconscious adults with a 4-year-old boy in the back seat. According to the East Liverpool police report, around 3 p.m. Wednesday an officer was driving behind a Ford Explorer when he noticed the vehicle was weaving back and forth erratically. The driver then skidded to a stop next to a school bus and then drifted to the side of the road. The officer approached the driver, later identified as 47-year-old James Acord, whose head was bobbing back and forth and whose speech was unintelligible. Rhonda Pasek, 50, was unconscious in the next seat, according to police. When the officer asked Acord what was going on, he said he was trying to take Pasek to the hospital, and then tried to drive off. According to the police report, the officer had to pull the keys out of the car to get him to stop. Acord then went completely unconscious. Pasek's 4-year-old son was in the back seat. The officer called EMS and paramedics administered "several rounds" of Narcan. "We feel it necessary to show the other side of this horrible drug," the city wrote on its Facebook page. "We feel we need to be a voice for the children caught up in this horrible mess. This child can't speak for himself but we are hopeful his story can convince another user to think twice about injecting this poison while having a child in their custody. We are well aware that some may be offended by these images and for that we are truly sorry, but it is time that the non drug using public sees what we are now dealing with on a daily basis." Acord and Pasek were both transported to East Liverpool City Hospital for treatment and then booked in the Columbiana County Jail. Acord is charged with OVI, endangering children and stopping in the roadway. Pasek is charged with endangering children, OVI and seatbelt. The boy was placed with children's services.